This crisp recipe is easy, sweet, spicy, and delicious, with the sugary-tart taste of apples (or basically any fruit you like). 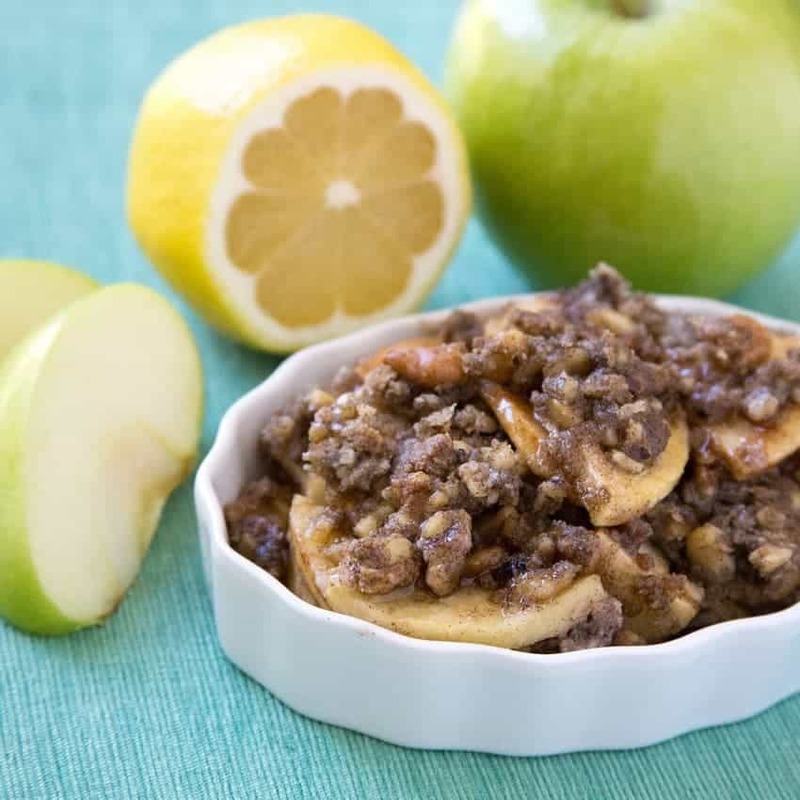 And best of all, this apple crisp recipe is completely gluten-free and paleo-friendly. This grain-free apple crisp recipe is easy to put together and so delicious, no one will miss the grains! It’s Paleo-friendly too, and dairy-free (assuming you use coconut oil instead of butter). I’ve tried this grain-free apple crisp recipe with fresh mixed berries, peaches and apricots too – it’s equally delicious. I usually swap cardamom for the cinnamon when I’m using berries, but otherwise everything is just the same. 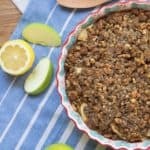 I serve this grain-free apple crisp recipe warm for dessert, sometimes topped with whipped coconut cream or ice cream. Is also perfect at room temperature the next day, I eat it for breakfast if there’s any left! Lightly grease a 9 or 10-inch deep dish pie pan or cast iron skillet. In a large bowl, combine apples, lemon juice, 1 TBSP maple syrup, vanilla, tapioca starch, 1 tsp cinnamon and 1/4 tsp salt until well mixed. Pour apple mixture into prepared pan, scraping down sides to get all the juice into the pan. Add walnuts, coconut, coconut flour, butter or oil, and remaining maple syrup, cinnamon and salt into the same large mixing bowl and stir to thoroughly combine. Crumble this mixture evenly over the apples. Bake for 25-30 minutes, until apples are bubbly and top is golden brown. This entry was posted in Baked Goods, Dairy Free, Desserts, Grain-Free Goodness, Paleo Friendly, Recipes and tagged autism diet, autism gluten free, autoimmune disease, celiac, celiac disease, dairy free, g-free diet, G-Free Foodie, gluten free baking, gluten free food, paleo, paleo friendly. Bookmark the permalink.